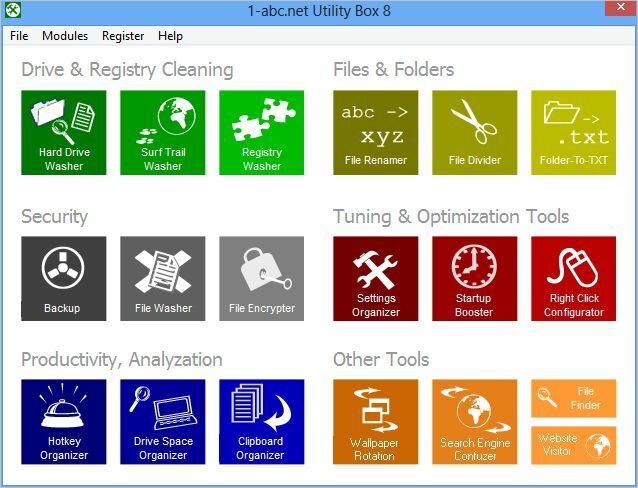 This product combines 15 Windows cleaning and optimization tools to keep your system running fast and secure. Hard Drive Washer deletes unnecessary data, Surf Trail Washer deletes your internet trail, Registry Washer cleans up your Registry. Startup Booster allows you to configure your Windows startup, File Washer erases data completely and File Encrypter can hide it. With Settings Organizer you configure or tune up your system ... and much more! Fixes the little nuances of programs like AOL and AOL IM. Preventing you from accidentally signing off, sending text to the wrong IM. Even has a panic feature to INSTANTLY hide all your AOL IM chat windows and others.